The Dutch Safety Board published the findings of their investigtion into a serious incident at Eindhoven Airport when the takeoff was rejected after the takeoff decision speed (V1).The Boeing 737-800 operated by Ryanair was taking off from runway 04 on the 4th of June 2010 at Eindhoven Airport, the Netherlands. At the time of rotating the aircraft to takeoff, the pilot flying decided to reject the takeoff because he believed the aircraft was unsafe to fly. The decision to reject was made after the takeoff decision speed (V1). The pilot performed a so-called high speed rejected takeoff. The aircraft was halted before the end of the runway and the aircraft was subsequently taxied back to the terminal. The aircraft sustained no damage and no passengers or crew were injured. During the takeoff at Eindhoven airport the pilot flying perceived two control issues and one speed trend vector anomaly. The explanation for the control issues and speed trend vector anomaly was likely related to an outside atmospheric phenomenon. The origin of this atmospheric phenomenon could not be determined or explained with the information available. The takeoff was rejected after the decision speed V1 and while the nose wheel was off the ground for approximately two seconds. The First Officer who was the pilot flying considered the control and speed trend vector problems to be serious enough and decided to reject the takeoff. According to company procedures only the Captain is authorized to make a rejected takeoff decision. To reject a takeoff above V1, especially when the nose wheel is off the ground, is in principle considered to be improper and unsafe. There is no specific guidance from the operator or manufacturer on dealing with control issues at the time of rotating the aircraft. 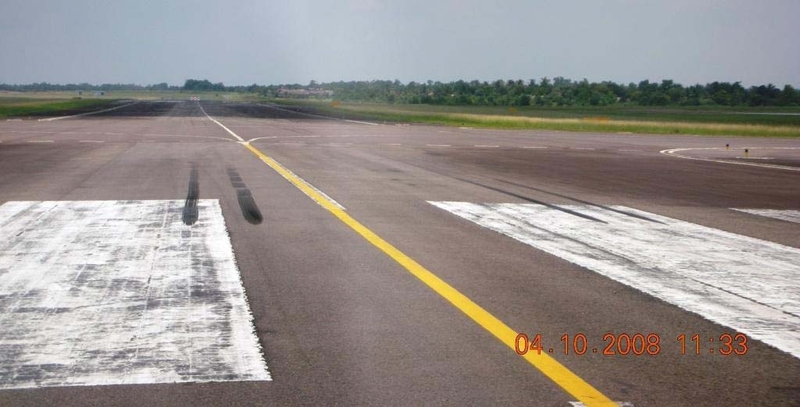 Specific guidance on rejecting a takeoff exist in case of an engine failure. Review of past statistics and studies show that pilot training and requirements focus on rejected takeoffs due to an engine failure. Studies and statistical information show that this accountsbfor less than 25% of the reasons for rejected takeoffs. Thus 75% of the reasons the reject a takeoff is not trained for. On January 25, 2010 a Boeing 737-8AS(WL) passenger jet, registered ET-ANB, was destroyed in an accident 6 km southwest off Beirut International Airport (BEY), Lebanon. All 82 passengers and eight crew members were killed. The airplane operated on Ethiopian Airlines flight ET409 from Beirut International Airport (BEY) to Addis Ababa-Bole Airport (ADD). The progress report indicated that IMC prevailed for the flight, and the flight was on an instrument flight plan. It was night in dark lighting conditions with reported isolated cumulonimbus clouds and thunderstorms in the area. Flight ET409 was initially cleared by ATC on a LATEB 1 D Standard Instrument Departure (SID) from runway 21. Just before take-off, ATC changed the clearance to an “immediate right turn direct Chekka”. The Boeing 737 took off from runway 21 at 02:36. After take-off ATC instructed ET409 to turn right on a heading of 315° and change frequencies and contact Beirut Control. ET409 acknowledged the clearance and continued a right turn. ATC instructed ET409 to turn left heading 270°, which was acknowledged. The flight continued the climbing left turn to heading 270° but did not maintain that heading. The aircraft continued on a southerly track. Just prior to reaching altitude of 7700 feet, the stick shaker activated, sounding for a period of 29 seconds. 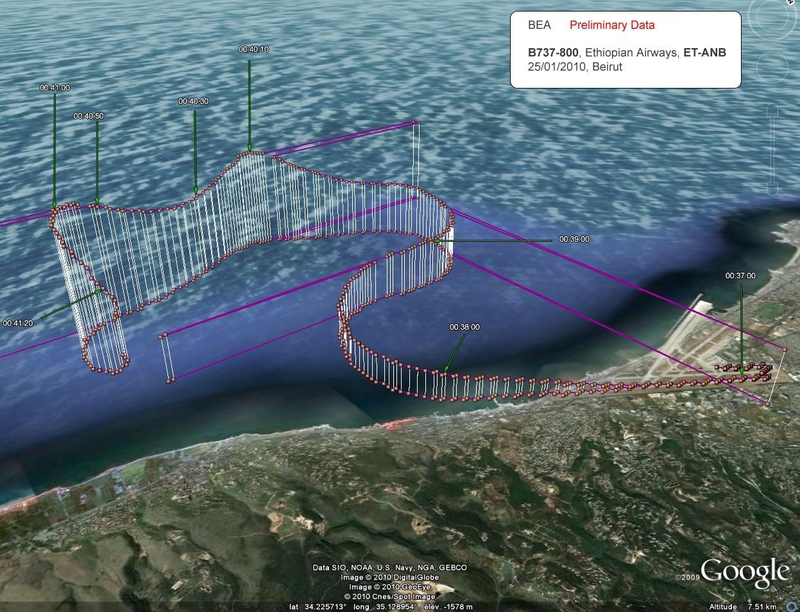 Meanwhile the airplane reached an angle of attack (AOA) of 32° and began a descent to 6000 feet. When the stick shaker ceased, the aircraft began to climb again. At 02:40:56, just prior to reaching 9000 feet, the stick shaker activated again, sounding for a period of 26 seconds. After reaching 9000 feet the aircraft made a sharp left turn and descended rapidly. The maximum registered bank angle was 118° left and the airplane reached a maximum registered speed was 407.5 knots at a G load of 4.412. The airplane disappeared from the radar screen and crashed into the Mediterranean Sea at 02:41:30. The aircraft weight and balance record was reviewed and no deficiencies or anomalies were noted. No defect or deferred maintenance item was reported on the technical log after the arrival and before departure of the plane from Beirut. The examination of the maintenance documents on this aircraft did not reveal any significant anomalies. Based on the elements recovered up to 24 Feb, 2011 and the visual observation, no evidence of fire has been brought up. The Flight Crew and Cabin Crew were licensed in accordance with the ECAA regulations. The documents received by the Flight Crew prior to departure, including weather information, were in accordance with the relevant requirements. The Captain had a total flying experience of 10,233 hours of which 188 hours on B 737-700/800. The First Officer had a total flying experience of 673 hours of which 350 hours as F/O on B 737-700/800.